1. Cut your pipe cleaners to fit onto your craft stick. You'll need enough pipe cleaner to lay along the stick and the some sticking out to make the antennas. Glue the pipe cleaners side by side on ONE of the craft sticks. 2. Cut a piece of construction paper in half, length-ways. Attach the two pieces of paper with scotch tape. 3. You need to cut three triangles from your strip of paper. One in the center (where the tape is), one each between the center and the outer edges. Cut your triangles about half way down the paper. 4. Design and color your butterfly with markers or crayons. 5. Fold your paper accordion-style, triangle end facing up tape the bottom of the accordion with scotch tape. 6. Glue a craft stick on either side of the accordion, flush with the scotch tape at the bottom (the stick will stick out a bit at the top). 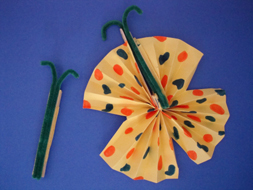 Unfold your caterpillar to change it to a butterfly, you'll have to twist the antennas around after changing.